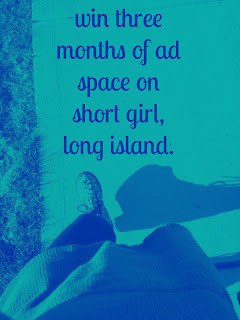 short girl, long island. : Giveaway, Day Ten: 3 Months of Ad Space. CLOSED. Do you own a blog or business, but don't have it in your budget to advertise? Well, you're in luck! The giveaway for the day is three months of "Saver" ad space on short girl, long island. Don't have a blog or business, but know someone who does? If you win, you can gift the ad space to a friend - remember, this is the season of giving, folks. Saver ads are $5 per month, but come with loads of goodies - a Sponsor Spotlight, plus the option to host a giveaway or product review on the blog. Since you get three months, you can mix it up a bit! Use the Rafflecopter setup below to enter. If you've missed any of the giveaways featured so far, you can catch up here. some free ad space sounds perfect. Guest posting and giveaways always help!!! Ad space & a spotlight are fantastic strategies to support my side biz, and word of mouth and social media work WONDERS as well. I think Twitter has been an awesome blog promoter for me! I think participating in linkies are a great way to promote your blog. As for my business, I like ProjectWonderful. But I'm not great at promoting it, honestly, so take that with a grain of salt.